Until nowadays we have looked at using E-ink displays only in devices for reading. But in fact sphere of application is much wider than we could consider. The main producer of paper-like screens - E-ink corporation decided to enlarge sphere of application of their production. On international exhibition of development in area of technologies of mapping of information "SID 2013" the company showed a new product - screen of E-ink spectria which can reproduce three colours. In contrast to black and white E-ink screens (Vizplex, E-ink Pearl and E-ink Carta), which are widely used in ereaders, in microcapsules of new displays there're not two kinds of microgranules but three - black, white and painted in any other colour (if you want to know about constructionof black and white screens in details, you can see the material "Principle of working of E-ink display"). Display of E-ink spectria, first of all, is intended for using in the electronic price tags, which, to E-ink Corporation's mind, should soon appear in big supermarkets. It's counted, that big trading networks spend about 50 000 dollars for expendable materials for producing price tags for their production. that'swhy this corporation decided to put their money into produsing of devices, which can automate process of replacement of this information. Size of such devices can be from 2 to 6 inches. 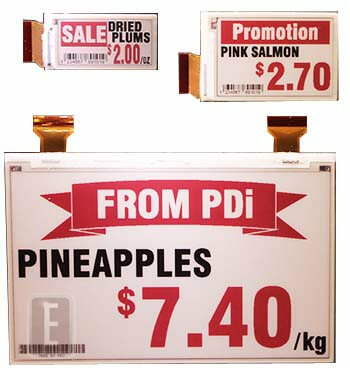 The main advantage of electronic price tags is operative exchange of pictures about the whole shop, for example, at the time when some sales are hold and also energy almost isn't consumed at other time. The main disadvantages of modern smartphones are short time of working of battery in mode of browsing of information and also they can't be used with direct and bright sun light. Both these disadvantages're connected with application of displays made by technology of TFT or IPS. International company Onyx International was the first, who has made smartphone with E-ink screen with LED lights. This ensures good visibility of the screen in any lighting condition, as well as reduced energy consumption. To company's mind, model Onyx E43 is made for containing smartphone and ebook in one device. 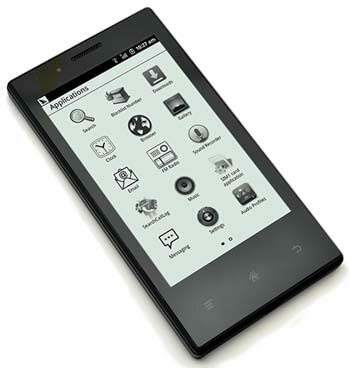 Smartphone is made withapplication of E-ink display with dioganal 4,3 inches, 800 x 480 pixels, Cortex-A5 processor with 1 GHz, RAM and non-volatile memory 512 MB, card slot microSD, Wi-Fi adapter and Bluetooth. Device's battery has a capacity of 1800 mAh. Through the use of the operating system Android 2.3, there can be installed extra apps. Company OAXIS has madea very original device, which is put on like a usual case on the body of your phone, so then you have a phone with 2 displays - TFT and E-ink. Case IncCase is powered by its own battery with capacity of 500 mAh, and communicates with the telephone interface Bluetooth. Its display (3.5-inch with a resolution 600x360 pixels) always shows any information. For reader's choise it can show a photo or calendar, but also there can be nstalled books. 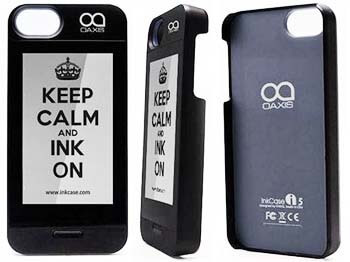 Case IncCase is made in variant for iPhone 5, Samsung Galaxy S4 and Samsung Note II. CoverRedaer is a thin and lightweight book-coverfor smartphone Samsung Galaxy S4 with sensory e-ink display with dioganal 4,3 inches and 800 х 480 pixels. 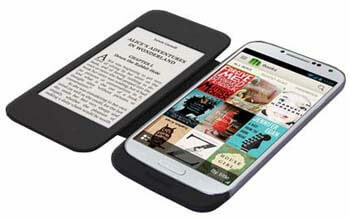 Cover CoverReader is powered by smartphone's battery. Pages can be thumbed through by buttons or by sensory display. Besides reading books on it, you can view documents, e-mails or texts from the Internet. 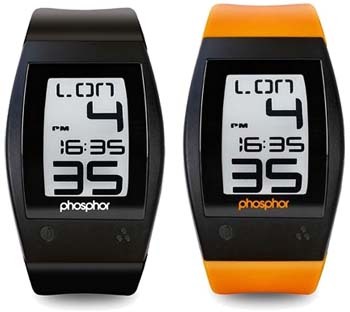 The company Phosphor has released a new model of watches with dial by touch E-ink display. This watch can show the time in one of 24 time zones, and easily switch between reading zones. More than that, you can switch the display mode, time or date and time. Waterproof plastic case is made in sports style black, orange or white.